An HP Pavilion dv7 laptop will not boot, or even post. It does power on briefly (fans spin up, LEDs come on) when the Power button is pressed, but it does not beep/post or display the bios. Instead it almost immediately turns off again. 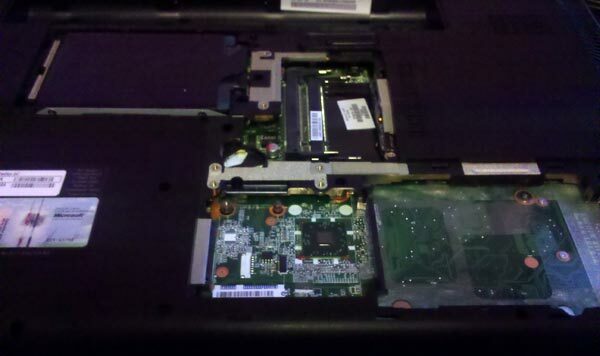 The person who last used this laptop reported sparks going off when the keyboard was touched. Holding down the power button for more than 10 seconds resolved the issue. The laptop now boots again. Technically I'm not really sure what that did, but I'll take it! Could be the DC Jack....I just replaced 2 this week on HP laptops. I know the ZV5000 and a few others have this issue. Do you get a battery charge symbol when adapter is plugged in? Not the answer you're looking for? Browse other questions tagged laptop boot or ask your own question.